Archer on Airguns: Great Performance from Stoeger Pellets in the Beeman 1073 Air Rifle! Great Performance from Stoeger Pellets in the Beeman 1073 Air Rifle! 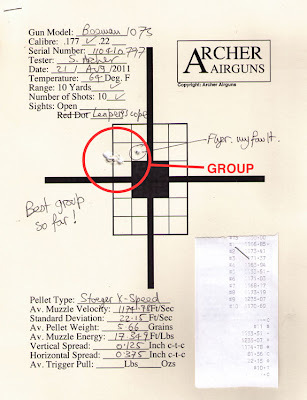 Now that Archer Airguns is selling spare parts for the Beeman Model 1073 air rifle (also known as "the WalMart dual barrel gun" and the "Beeman RS2"), I'm undertaking a comprehensive test review to better understand the performance of this air rifle. Little has been published on the web about the Beeman 1073, so I'm hoping that you will find this interesting! Today, we'll look at two 10-yard test targets shot with the 1073 using the .177 caliber barrel. The only change from the $98.00 gun I purchased from WalMart was that I fitted a Leapers 3-9x40AO scope and Leapers High Rings, as the Beeman Model 5005 scope would not give sharp focus at 10 yard range. The first group shows test results with the 8.66 Grain Stoeger X-Field pellets. These produced a very good 10-shot group while shooting at 900fps. Both the accuracy and muzzle velocity are very creditable for a sub-$100 air rifle shooting heavy pellets. The next group was produced by the same air rifle with the scope settings completely un-changed. This time, I shot Stoeger X-Speed PBA pellets. Now I've always found poor accuracy from PBA pellets, so my expectations were low. But I was completely amazed at this group - it was the best group of all that I shot with this gun and one of the best 10-shot, 10-yard groups I've ever shot with any spring air rifle! 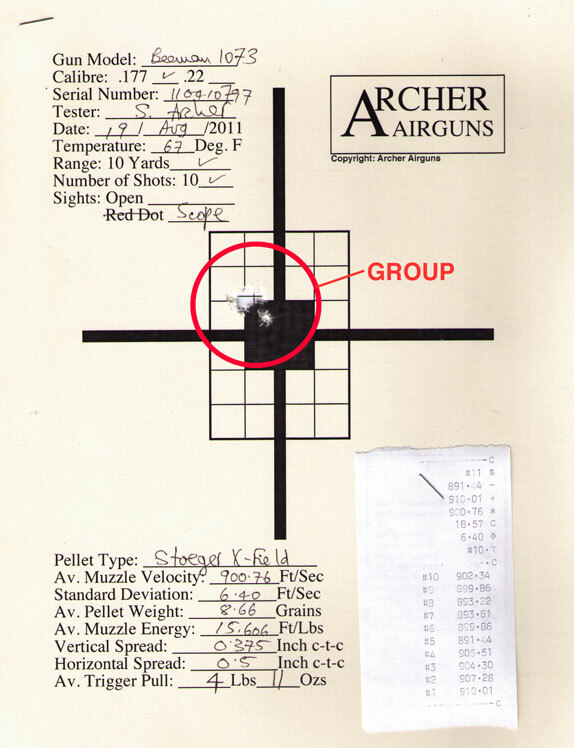 The target below tells the story and shows that the Beeman Model 1073 can achieve close to 1,200 fps with the Stoeger 5.66 grain PBA pellets. This performance produced a very commendable muzzle energy of over 17.3 ft/lbs in .177 caliber. The point of impact was surprisingly close to that of the heavy lead pellets, too, just a little to the left of the lead pellets from the same point of aim. One very noticeable difference when shooting the light, PBA pellets was the sound produced. The gun was MUCH LOUDER shooting the PBA pellets as they exceeded the sound barrier, whereas the heavy lead pellets did not. The crack of the pellets breaking the sound barrier was very sharp, but not unexpected. This is not a specific issue with the Beeman 1073, but will happen with any air rifle shooting light pellets faster than about 1100fps. Don't expect any air rifle shooting light PBA pellets at high muzzle velocities to be quiet - no matter what advertising claims you may read! Stoeger pellets are German-made and not cheap, but they certainly give an excellent result in the Beeman Model 1073 air rifle! There will be more test results as I continue to review this Beeman "WalMart dual barrel air rifle." But with results like this, it's difficult to see how you can go far wrong with this air rifle at a price of less than $100, so long as you feed it high quality pellets! I have this air rifle and I found crosman destroyers to be the most accurate at 10 yds. After locktighting "everything" and adjusting the Beeman 4X32 scope to 10 yds, I consistently shoot same hole groups prone supported. Destroyer EX's are a different story.The 22 cal barrel was not as accurate. To adjust my scope as an AO I turned the outside front ring until my crosshairs stopped moving when my sight angle changed. Works on my modded 1377 carbine too with a cheap 4X32 scope. Oh one more thing, I also adjusted my trigger using an allen wrench. I want relube the gun but I am afraid I will lose an already great shooting rifle. Airgun Safety. Don’t Let This Happen to You!